He was a lot of fun to make. 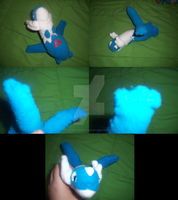 I've seen a lot of plushies with just grey all over but when i was looking at the reference I noticed that there is a bluish tint to the body. I knew I wouldn't be happy if i couldn't figure out a way to get close to the coloring. So instead of fleece I found a suede material to substitute the body material. I had to put more panels in it because the material doesn't stretch as fleece does. I do take commissions, see my journal for details and note me for requests. Omgawdddd, I adore so many of your works SOOO much! And my accept all art group, which has EVERY category, so you can submit all your awesome works!!! I am sending you a BIG F-A-T !!!! He's certainly around! ^_^ But I was dead set on getting the coloring right! Beautiful! 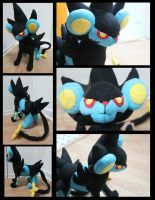 Hands down the best constructed plush of this pokemon I've seen thus far! THANK YOU ^_^ That's what I aim for! ^___________^ Thanks nina!!! 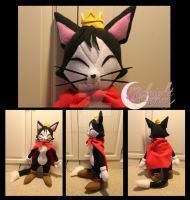 Spreading my plushie love! This is simply fantastic, you have done an amazing job! I'd def like to commission you again in future. Brilliant work! And it you made 2 more you could evolve 'em into a Magneton with a little bit of string! Oh, man, you did a fantastic job, and of my favorite Pokemon no less! Smart catching the blue tint! It's the perfect color~! Great work~! Thanks! I'm originally a painter, so I catch colors, hues, and tints super easy.